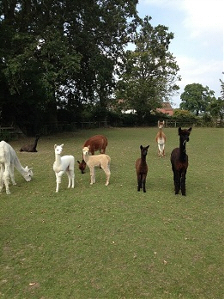 Coco Alpacas emerged from Polfages Alpacas after moving back to the UK from France, in October 2013.I acquired 2 pregnant females before moving to France and after they had had their cria they followed me there with some wethers and a stud male. The alpacas adapted very well to the French climate as we were living near to the Pyrennees, so it was hot and dry with poorer pasture. While living in France my herd grew to a total of 18 Huacaya alpacas after having more cria and rescuing a few along the way. On returning to Church Stretton in Shropshire last autumn all the alpacas came back with me, some of which some have been with me all the time. I still have a total of 18 having just sold some young males to make way for 5 cria due this summer. As well as the alpacas themselves, who are delightful, I think the fibre is amazing, being so soft and incredibly warm that it just has to be used. With my small herd I have a range of colours from white, beige, fawn, brown grey and black. The alpacas are shorn once a year in June and the fibre is sent to a mill in in the UK for processing and made into knitting yarns. Some of the yarns, which are all natural colours, are sold and some are knitted, crocheted or woven into hats, scarves, mittens, and throws which are sold online or in our shop in Church Stretton. We also have a range of crocheted alpaca toys which depict the colours and characters of my herd!